Yesterday was the last date for submitting proposals. Now we have 143 proposals, which includes workshops and regular talks. Now it's time for voting and commenting. Everyone can participate in this process. You are welcome to provide feedback to the speakers about their proposals. Your feedback through comments will help the speakers to improve the proposal. I think it will be a challenging task for the selection committee to come up with a final list of talks. I have proposed two talks, but I prefer to present the second one - about pytest. Pytest is my favourite testing tool. Please let me know your suggestions about this talk. PyCon India 2014 Call for Proposal deadline is approaching. Now there are 90+ proposals in the funnel. If you haven't proposed any talk yet, this is the time! Since we have 90+ proposals, chance for extending date of deadline is less. So, hurry! IMHO, every Python community member should try to promote Python 3. I know there are criticisms about Python 3 -- whatever it is, "Python 3 is the present and future of the language". Constructive criticisms should be welcomed and that should lead to better Python 3.x releases. As a community member what we can do to promote Python 3 ? I am looking forward to your thoughts on this. Please write your comments here or you can write it in your blog and leave a link here. Before giving any new suggestions, let me check what are the small things that I have tried. In the beginning of 2011, I have created a website with the help of other community members to increase the adoption of Python 3 by collecting issues in a central location. That idea didn't worked well, then I dropped that project. I have given a lightning talk about that project during PyCon 2011 in Atlanta. I have tried to use Python 3 for my personal projects and written blogs about my experience. I used Python 3.4 in my Selenium documentation. In fact this actually reduced the number of steps to install Selenium. I have always given an up-vote in Python sub-reddit for the posts related to Python 3. Whenever I conduct a workshop or training on Python 2, I tried to point out how the same works in Python 3. Well, these are the few things that I could recollect now. I am sure, there will be many other things which is going to help the adoption of Python 3. For example, this could be one good idea: Encourage Python 3 related talks, workshops etc. in all PyCon conferences and other regional Python related conferences. Looking forward to your ideas to promote Python 3 and increase the adoption! The Sixth edition of PyCon India is being held in Bangalore,India from 26th September 2014 to 28th September 2014. The organizers of PyCon India 2014 are looking for talk and workshop proposals to fill the formal presentation and workshop tracks. We accept proposals on a very broad range of topics related to Python programming. This is the beginning of an attempt to write more things in my blog. I am thinking to write more personal things :-) Well, when I say "personal", I mean Religion, Family, Politics etc. I used to write mostly technical topics in my blog. Writing personal matters is very different from technical stuff. So, I would like to do some preparations. I know that my blog is subscribed at many places. Some of them are various Planets (public blog aggregators) and others are individual subscriptions. In addition to this, I have linked my blog with Facebook. So my writings are reaching out to such a wide audience. This includes my friends from childhood, family and extended family members, neighbors, classmates from my schools and colleges, colleagues from current and previous organizations, participants from my various training and workshops, friends from Python and other FOSS communities, and many other friends. The topics that I am writing may not be interesting or pleasing for all. Now, what should I do ? I am looking forward to your suggestions. One thing that I am thinking to do is to remove Facebook linking. So all my posts will not go to everyone's FB update streams. If really required I can share the links separately. I have updated some active Planets with my technical or Python feed. Another option is to create another blog itself. Based on my previous experiences, I have observed that It's not easy to maintain more blogs. I will be updating this blog post with my further thoughts later. I was playing with Go programming language (Golang) recently. Go looks like an interesting programming language. I will show you how you can install Go in a 64 bit GNU/Linux system. Here is the screencast I created with same notes. 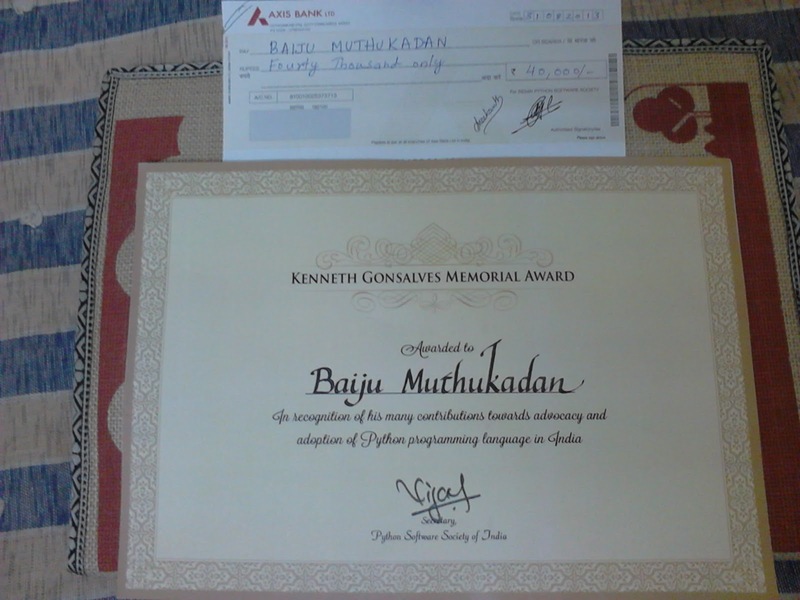 I received the first Kenneth Gonsalves Memorial Award for contributions towards advocacy and adoption of Python programming language in India. 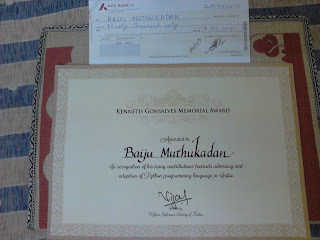 My thanks to the Indian Python Programming Community and Python Software Society of India (PSSI) for the award. The award was given on the first day of PyCON India 2013 conference (last Saturday). This is the 5th year of PyCON India, There was more than 1100 attendees this time. The keynotes, talks, workshops and panel discussion (on Python in education) were great. I had my workshop (tutorial) on Selenium last Friday. I hope the video will be available soon. Copyright 2004-2011 Baiju Muthukadan. Picture Window theme. Powered by Blogger.